Einstein's theory of relativity predicted them and this year their observation was finally announced. 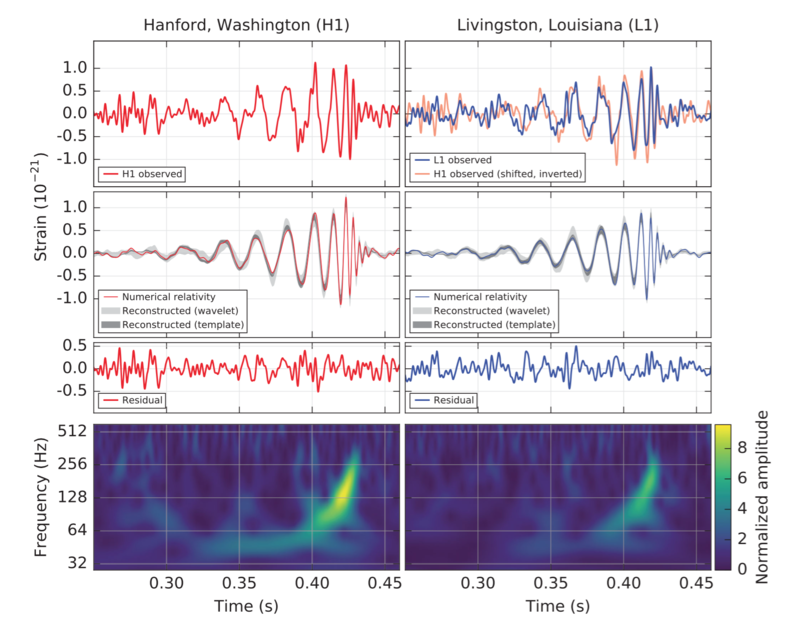 Two laser detectors in the US registered a wiggle in time and space, an echo of the union of two black holes some 1.3 billion years ago. Now scientist have a new tool to study the history of the universe. March 22, 2016: the date is engraved in the Belgian collective memory. An attack at Brussels Airport was followed by an attack on the Brussels Metro. 3 suicide attackers made 32 victims. The Washington Post made an animation of the air traffic to Brussels Airport just before and just after the attack. After the airport was closed, all incoming flights were diverted. It took almost two weeks before planes started to fly again from Brussels Airport. Unfortunately, Brussels wasn't the only scene of terror in 2016. On July 14, a mad driver killed 85 people in Nice and Istanbul and other Turkish cities were target of bomb attacks multiple times. But underreported in Western media are the attacks in Iraq, Afghanistan, Nigeria and other parts of the Middle East and Africa. 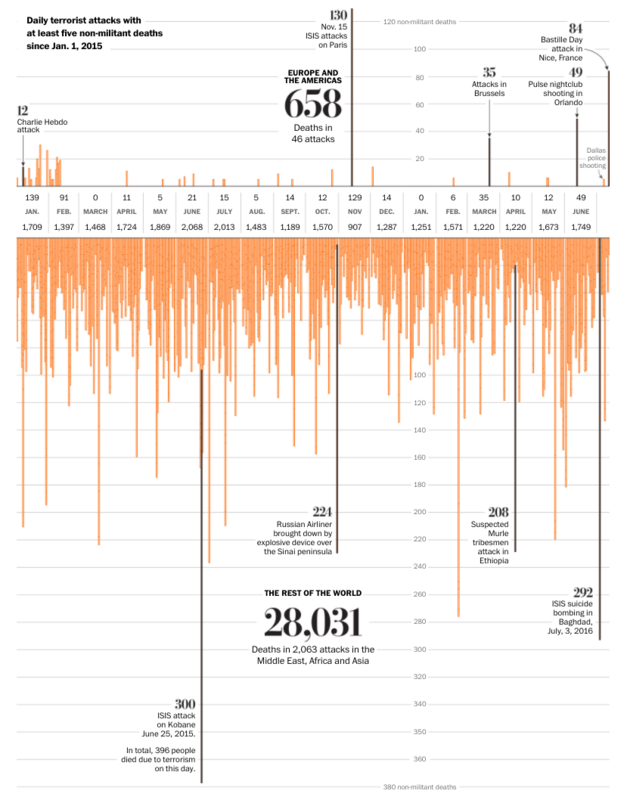 The biggest share of casualties of terror fall in those countries, and not in Europe or the United Sates. And then we're not even talking about Syria. 2016 was also the year of the Panama Papers, the Bahamas Leaks and Football Leaks. In most cases the leaks confirmed what was already known: rich people and big companies use exotic countries to evade taxes. The constructions they set up might be legal, but ethical questions should be addressed as well. 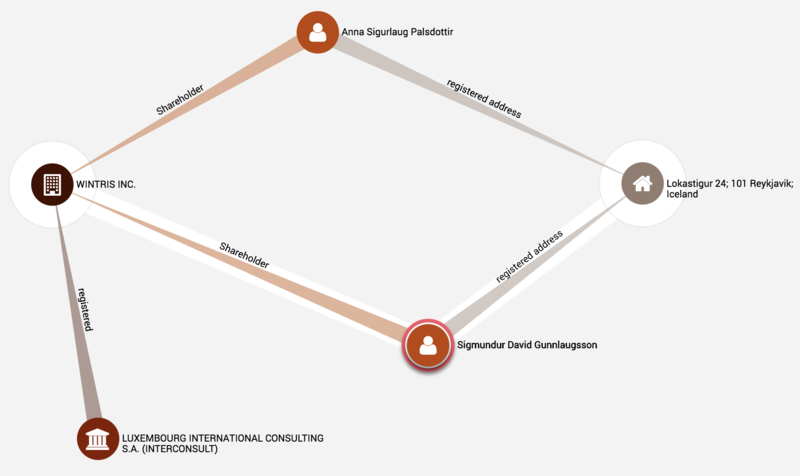 One of the most important people that were impacted by the Panama Papers was Iceland's prime minister Gunnlaugson. He turned out to be the owner of an offshore company on the British Virgin Islands and had to resign. On June 24, the Brits, against the odds, voted to leave the EU. 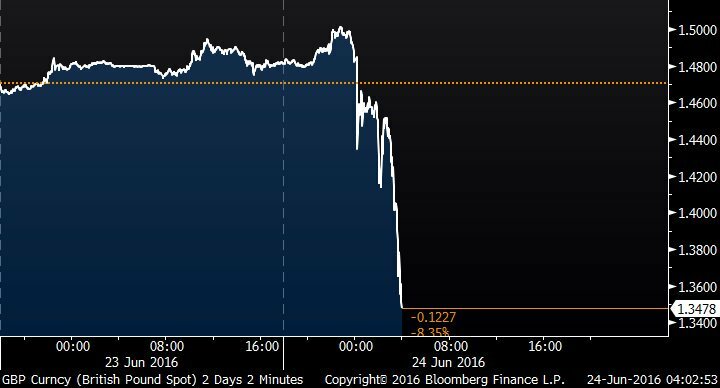 The British Pound made a dive after the announcement of the referendum result and dropped to its lowest value against the dollar in 30 years. 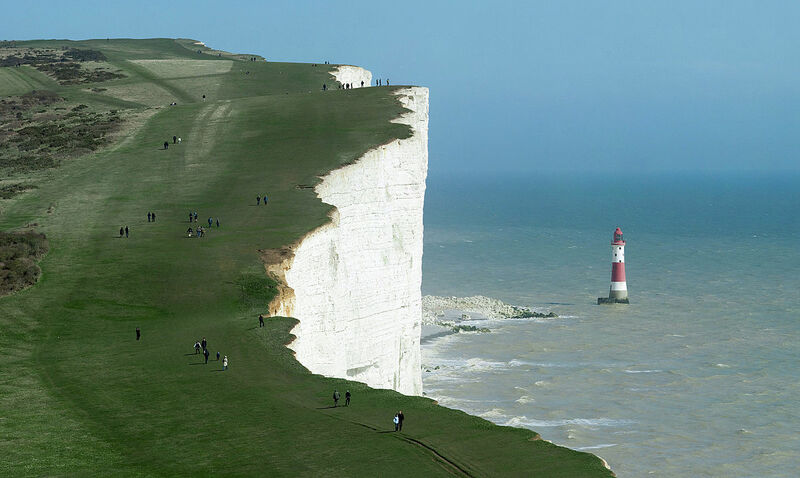 The chart shows a remarkable similitude to the silhouette of the cliffs of Beachy Head. The cliffs are notorious for the high number of suicides. Rockets that are no longer disposable and are capable of safely landing back on earth are giving the space industry renewed stamina. Launching new satellites is getting much cheaper. Elon Musk's Space X had its Falcon 9 commercial rockets land back on land and on drone ships at sea, Jeff Bezos' Blue Origin aims to launch people in space and also recycle the booster rocket. In September, Musk also unveiled his plan to bring people to Mars. One of the stories of 2016 was of course the race to become the president of the United States. Numbers and data played a big role in the battle between Hillary Clinton and Donald Trump. Trumps chances were systematically underestimated during the primaries and in the buildup to November 8, the day of the elections. Trumps victory came as a surprise for many. The chart below shows the evolution of the chance to win the election during election night, as predicted by the New York Times model. The chart shows the complete turnaround in favor of Donald Trump. "Post-truth" was named word of the year by Oxford Dictionaries and fake news was a hot topic in 2016. Many saw these as an explanation for Trumps victory. Fact is that fake news can spread virally through social media and debunking it is hard. 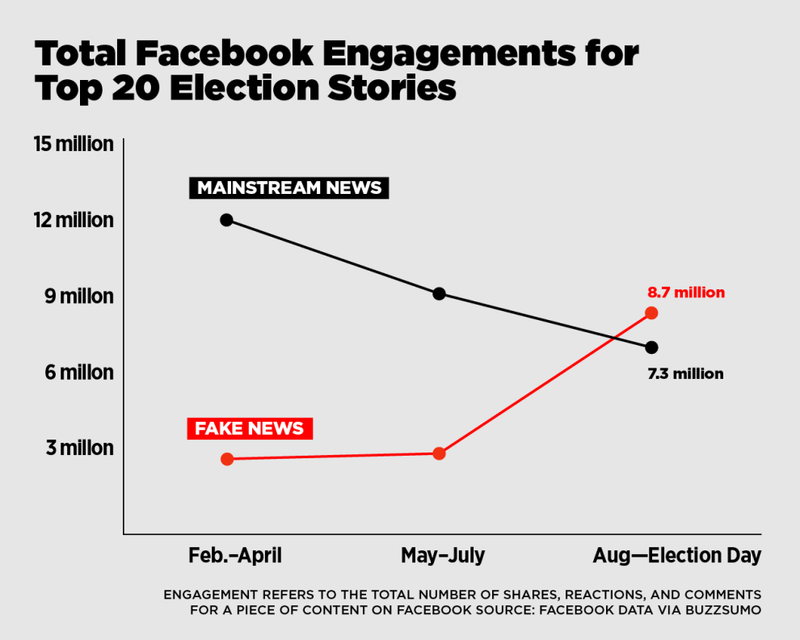 A Buzzfeed analysis showed that in the days before the election, fake news stories had more engagement than real news stories about the election. Google and Facebook were demanded to take measures to stop the propagation of fake news. The European Central Bank continued its policy to buy government bonds in 2016: every month it bought 80 billion Euros worth of bonds and other debts. After 10 years of crisis management, the ECB's balance has grown to 3.566 billion Euros, the equivalent of one third of the Euro economy and a record. 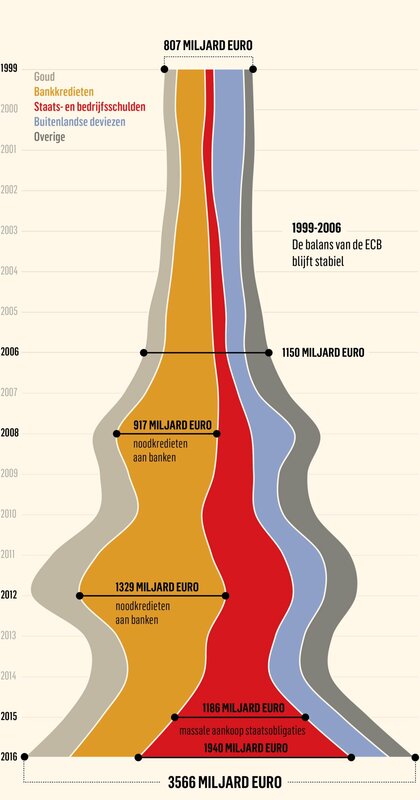 This graphic (in Dutch) shows the shift in the composition of the balance. The year hasn't come to an end completely, but according to climate scientist 2016 will repeat 2014 and 2015 in being the hottest year on record. 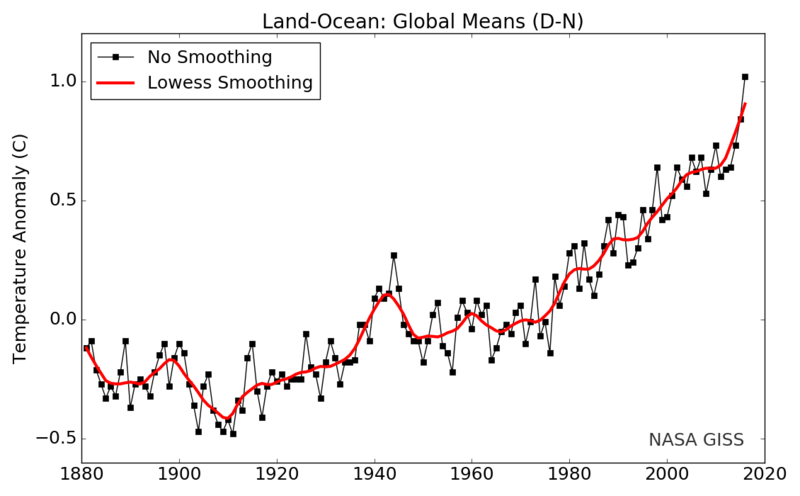 This chart shows the deviation of global mean temperature for every December-November period to the historical mean temperature (the reference period is 1951-1980). December 2015-November 2016 was on average 1.02°C warmer than the average. The red line shows the trend. On both the Arctic and the Antarctic, past months have been unusually warm. The North Pole is freezing much slower and the South Pole is melting much faster than in other years. As a result, the worlds sea ice extent is at a record low.